Quad biking the Upper Wanganui. Hi guys, Well here is what I have been promising you for a few days now and as I have been very busy with trips this is the first few hours I have been able to sit down and try and give you an idea of what this is all about and what real wilderness trout fishing can be like. Today it is windy, raining and foggy in Taupo so my chopper flight into the Mohaka has been cancelled till friday which is a shame as I was looking forward to it but I’m sure the rain has done some good. 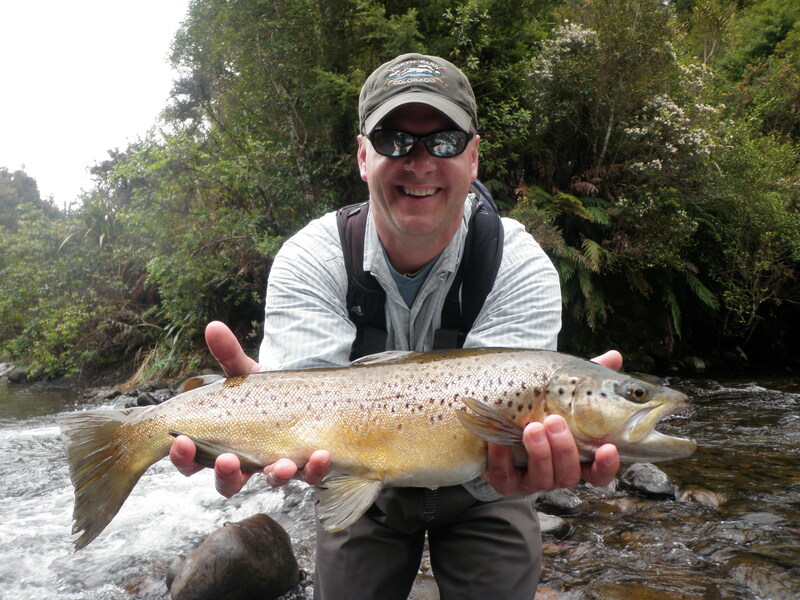 I have been lucky enough over the past week to have some great clients from the USA which have had some fly fishing experience and have been able to lay down a half decent line in order to fool some quite smart back-country fish. 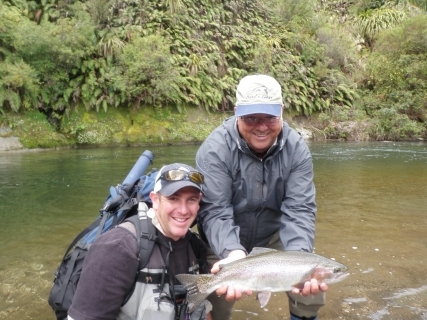 They have fished all over the world and experienced different fly in scenarios to various New Zealand rivers but had not tried the quad biking into the water I have access to and mentioned at the end of the day it was the most fun filled , fish filled day they had ever had fishing and a returning date can be marked in the diary. The first outing into the Wanganui was from Spot X fishing lodge in Taumarunui and I was greeted by two fisho’s who had been fishing back-country from choppers for several days and were excited about the thought of quad bikes and fishing in the same sentence. Each client always receives their own quad bike and is responsible for steering and getting it to the river which is about an hour away through nativeÂ New Zealand bushÂ and shallow rivers. A safety and driving brief is given which then the clients have a quick run around a field to getÂ a feel for the bike before hitting the track. Safety is huge on the trip and you will be decked out with helmets and safety equipment and told to ride your own ride not anyone elses, their are no races or time frames on our day. I have several different beats in the upper section of the river and will pick the beat I think will be best for us to fish when considering water levels, clients fitness and when it was fished last. The beauty about having so much water with fantastic easy fishing in it is that there is no need to use the same beat in the same week and the fish can have a rest and get settled in again before the next clients. 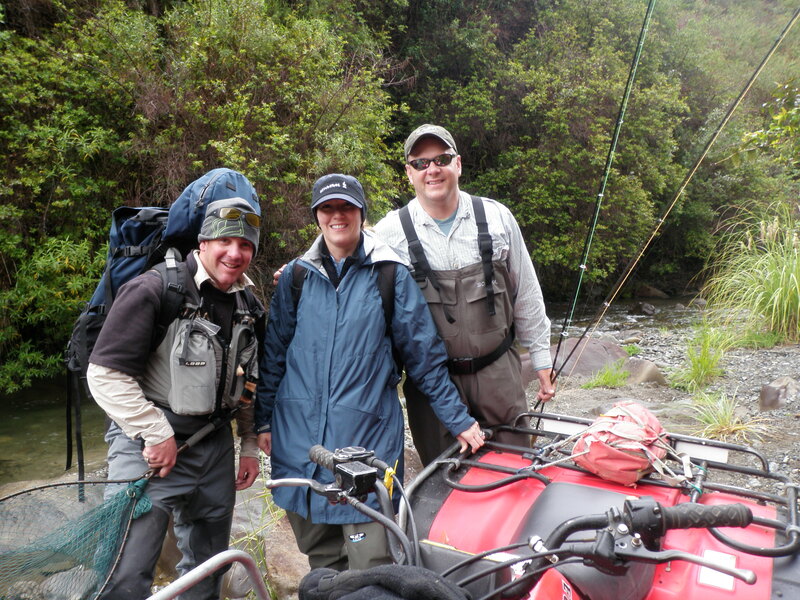 Bart and Larry from the USA were into their 60’s and had never been on quad bikes before and found the riding in to the river to be one of the most exciting adventures they had experienced while in NZ and that was before the fishing. They found the wading fairly easy and the length of the beat perfect with about 7 hours fishing making the entire day about 10 hours which is a good day outdoors by anyone standards. When arriving to the river I quickly set up the rodsÂ and put the billy on for a quick cuppa while talking about the next few pools and how to best approach them and who is going to fish as sometimes some anglers are much better suited for certain pools when it comes to back-casts or right or left handers. 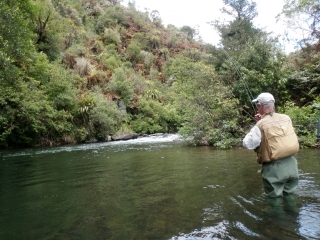 The river this high up is smaller than the Tongariro and each pool is best approached by one angler who the clients workout if they want to do pool for pool or fish for fish it does not really matter there’s plenty of fishing through the day for everyone. The first pool is a give me and these boys were good enough to get 4 fish in 6 casts from this pool which said to me were going to have a big fish number day. The strength of these back country fish are second to none and pound for pound they are fantastic which is why we usually get about a 50% landing rate, far better than the tired spawned trout in the Taupo fishery currently. 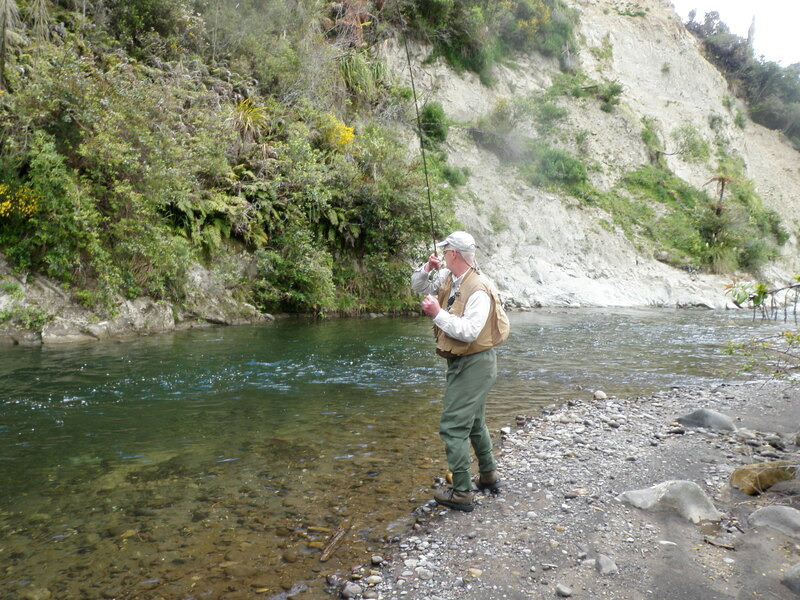 Throughout the day we wondered up the river slowly fishing every available pool or pocket water taking trout from just about every single pool. The Wanganui is low at the moment which has concentrated these fish into the heads of pools with riffley oxygenated water and locating them with the trained eye is fairly easily achieved. 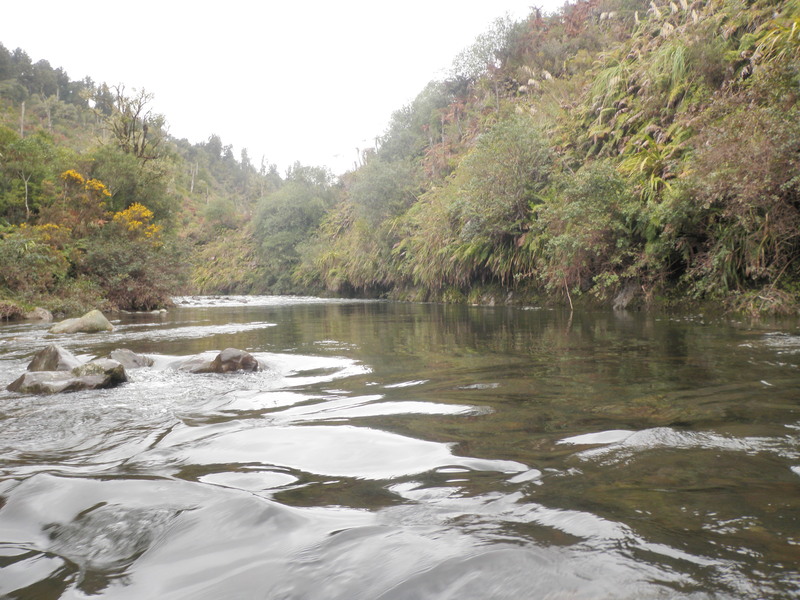 Taking your time in this river is important as the fish are fairly smart but will takeÂ a fly ifÂ presented Â correctly but also the scenery is like something out of Jurassic Park!, it really is an eye opener to what is out there and what we can enjoy with a little effort. 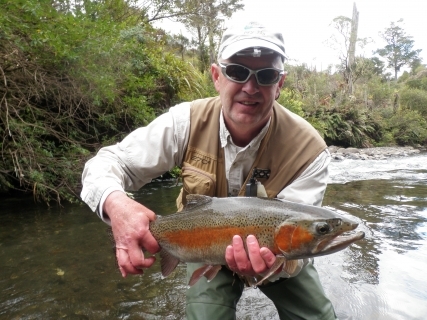 Trout are nearly all Rainbows but you can certainly bank on hooking a couple of pretty browns if you fish the slower flowing deeper pools with small naturals and long leaders. Fish range from 3-7lb in here and I’m sure there are larger ones but I just have not been able to land one as yet, why don’t you be the first!? 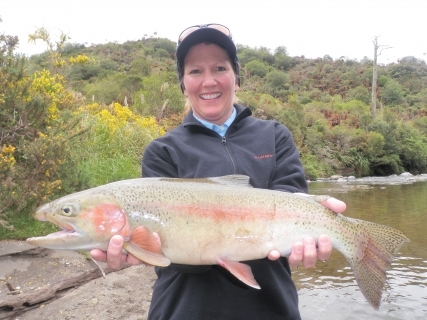 Trout are fat and in fantastic condition after spawning this year as you can see from all the photo’s but in particular the rainbow that Trish landed which weighed in at just over 7lb. Methods of fishing is nymphing or dry fly but so far this year I have not seen enough activity in here to tempt me to putting onÂ a dry fly but have done very well with small naturals. I have been using very small sliding indicators and a leader of fluro which can extend out to maybe 12 foot so in those deeper pools we can get down to the willy brown. Nymphs are really quite light and don’t need to be as heavy as somewhere like the Tongariro and using a 2 or 3mm bead fly and a small natural of the back will be getting you down and the attention of the fish quite quickly. This for Taupo fisherman makes for very easy casting and is such a nice change from trying to get 5mm bombs down in somewhere like Admirals. 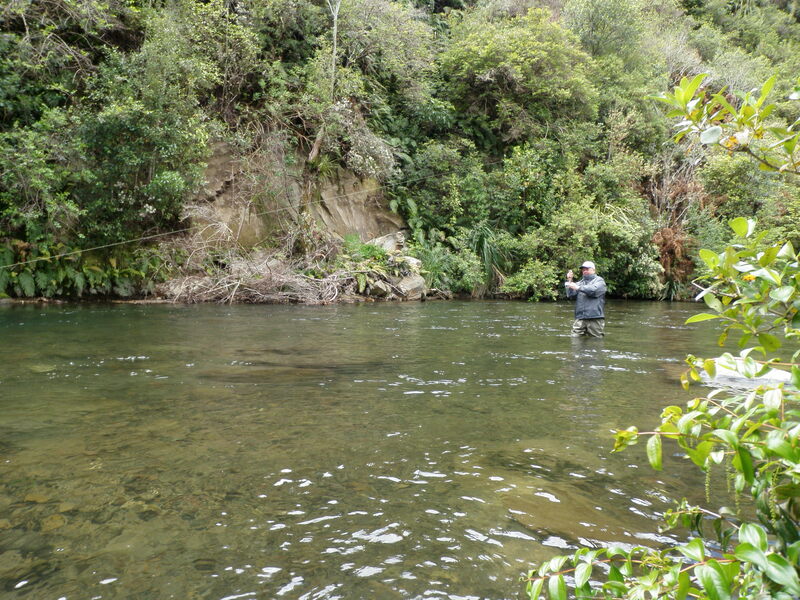 Trout in the back country are different creatures to fish for because at one extreme you need to be in stealth mode but on the other hand you can be relaxed about fly selection and they will almost take any type of nymphy looking pattern put in front of them. They seem hungry and if you have not hooked a trout in 5 casts in the top of any pool you move on as I doubt there is one in there. 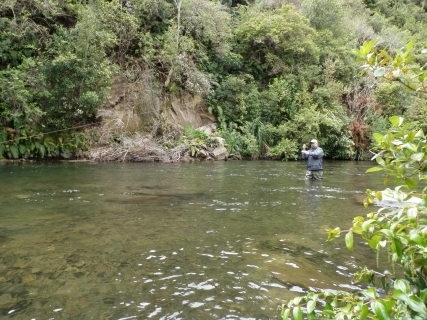 Nearly all the time if there are fish in the pool you can expect to hook a trout if you layÂ a decent cast in there and getÂ aÂ good drag free drift. When hooked up to these demons I do advise being a little heavy handed on these fish as they will head for down river every time and put you on your backing before you know it making netting for me a wet situation ( but something I am used to). I still use 8lb fluro on the tippet in here so you can give them a fair bit of pressure before that will give way and should hold most fish just fine if you have no wind knots (always check). Bart and Larry hooked up somewhere between 20 and 30 fish and landed roughly half of them due to the power of the trout and their surroundings which they know so well. Bart suggested that he thought they were the hardest fighting trout he had come across and in best condition for this time of the year. 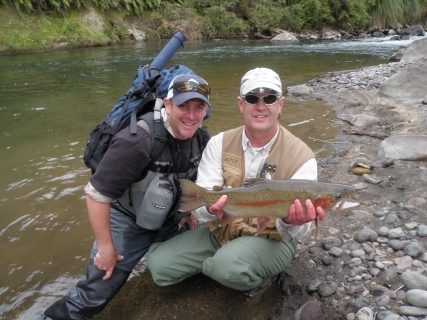 This was the best fishing they had received in New Zealand and wished they had an extra day to explore another beat which they will doÂ next time when we do aÂ camping trip. While we are fishing and wondering up the river I have contact with our quad bike man which is busy getting the bikes to the end of the beat for us so we don’t have to back track to get out in the afternoon. This is such a good well thought out way of covering plenty of water and makes the day very rewarding and easy on the clients. A lot of thought and time has been put into both tracks and creating good fishable pieces of water which again gives the clients plenty of opportunity to have the fly in the water. We finish the day with the ride back to the vehicles through a different cut out track so you can see a wee bit more of the country before hitting the car park roughlyÂ an hour later depending on everyone’s abilities. If the quad bike thing scares you and you don’t feel good about having to ride this is no problem as we can sit you on the back of ourÂ bike and get you in that way. I fished in here again yesterday with Dave and Trish and had similar success which at the end of the day both had new personal bests when it came to fish size. Trish has so far caught the largest trout which weighed just over 7lb but with one more heli fishing trip to go on Friday Dave still has a chance to break that record and avoid embarrassment before returning to California. 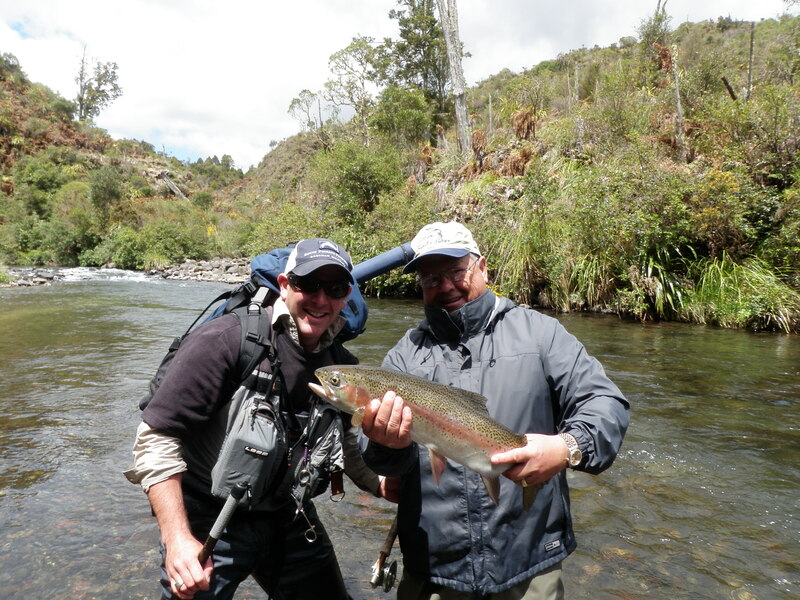 They also both had amazing fishing and enjoyed the whole aspect of being able to experience the ride in, native scenery, solitude and some truly awesome trout fishing without seeing any other human interference. I cant stress how good this trip is and if I was thinking of getting a guide for some backcountry fishing this would be where I would spend my money as this trip will be with you for many years to come. With the riverÂ at a perfect level and the fish responding well to fisherman the next month or so would be the ideal time to get in on one of these special trips. When doing these trips we can take one or two people for day trips or overnightersÂ and the price of the trips will slightly change due to numbers. Enjoy the pictures guys and hopefully this will spurr you into enquiring with any questions which may arise.